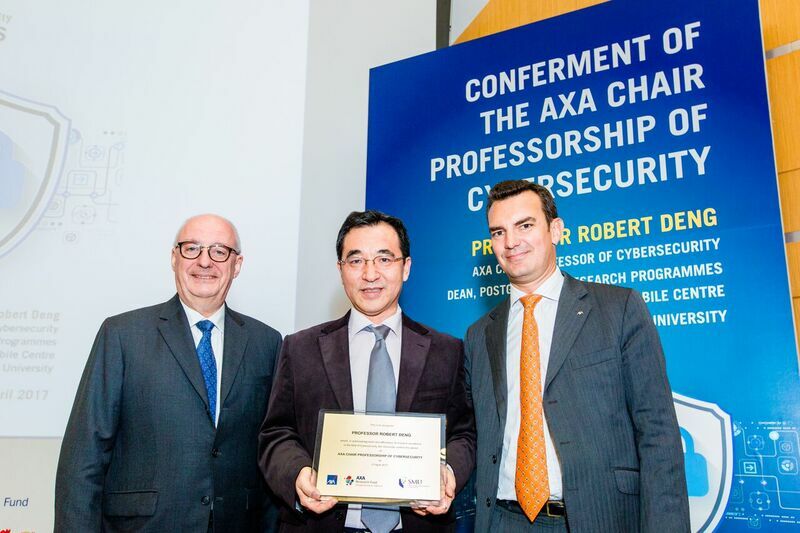 Professor Robert Deng from SMU’s School of Information Systems (SIS) has been conferred the prestigious AXA Chair Professorship of Cybersecurity for a period of eight years. Professor Deng is the first named Chair professor at SIS, one of only six AXA Chairs selected for this honour worldwide in 2016 and the only one from Singapore, as well as the only AXA Chair in Asia to undertake research in the Data & Technology risks cluster under the AXA Research Fund. The AXA Chair scheme is intended to support the development of a research area and to make meaningful contributions to the development of that research area in line with the host institution’s long term strategy. It aims at creating a full-time academic position in the host institution and fostering the career development of the professor appointed by AXA. 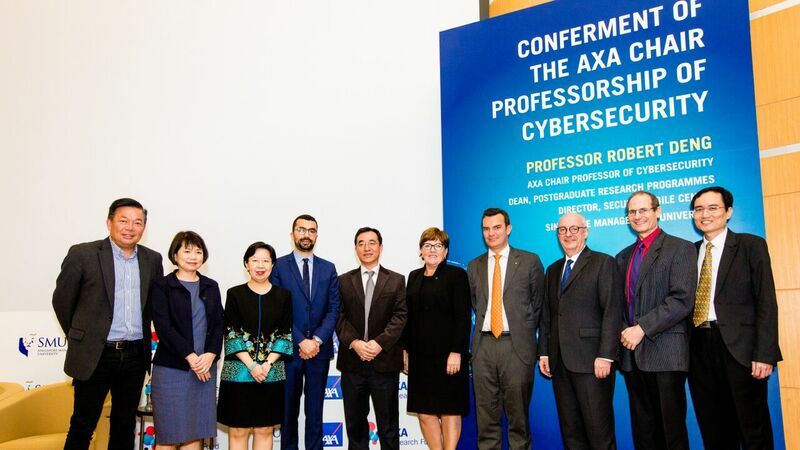 The official conferment of the AXA Chair Professorship of Cybersecurity was held today in conjunction with the inaugural SMU Cybersecurity Forum. More than 100 people attended the event, including SMU President Professor Arnoud De Meyer, SMU Provost Professor Lily Kong, Dean of SMU School of Information Systems Professor Pang Hwee Hwa, CEO of General Insurance AXA Asia, Mr Jean Drouffe, CEO of AXA Insurance Singapore Mrs Doina Palici-Chehab and Selection Officer at the AXA Research Fund Mr Chaouki Boutharouite, as well as representatives from government agencies, academia and the private sector. Professor Deng delivered the keynote speech on ‘The State of Cyber Threats and How to Fight Back’ in which he provided an overview of the cyber threat landscape, gave an in-depth analysis on the challenging nature of cybersecurity, and laid out the strategies to keep the good guys ahead of cyber attackers. Following his speech was a panel discussion on Cybersecurity by Professor Deng, Mr Chai Chin Loon, Senior Director of the Cyber Security Group of Government Technology Agency and Mr Mock Pak Lum, Chief Business Development Officer of StarHub. The discussion was moderated by SMU Vice Provost (Research) Professor Steven Miller. 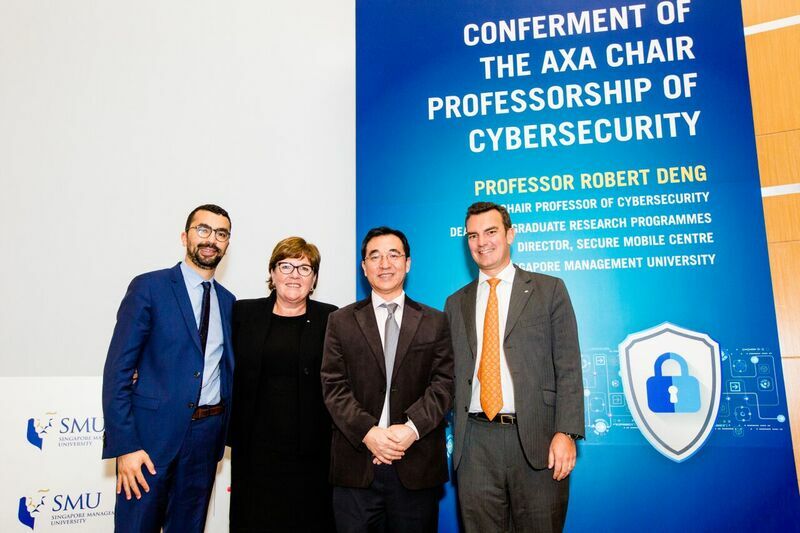 As AXA Chair Professor of Cybersecurity, Professor Deng will undertake a research programme to systematically investigate a unified framework for protecting data in the new environment. The research is expected to yield new security models, algorithms, protocols, and analysis techniques which will provide new ways of protecting data security and privacy. Another aspect of the research programme entails the integration of Professor Deng’s cybersecurity research with several of SMU’s larger scale projects in the Analytics for Business, Consumer and Social Insights Area of Excellence. He and his team will begin by working with SMU’s Living Analytic Research Centre, LiveLabs Urban Lifestyle Innovation Platform, and the Centre for Applied Socio-Physical Analytics. These centres will provide ample opportunities for Professor Deng and his team to test and demonstrate the new cybersecurity methods they will develop. Professor Deng earned his bachelor’s degree in Electrical Engineering from the National University of Defense Technology in China and his Masters and Doctorate in Electrical Engineering from the Illinois Institute of Technology. He has served as a post-doctoral researcher and lecturer at National University of Singapore, and was one of the initial principal researchers at A*Star before joining SMU. Professor Deng is a leading authority and award-winning researcher recognised globally for his work in data security and cybersecurity. His research interests include data security and privacy, multimedia security, network and system security. Over his 30-year career, Professor Deng has obtained 26 patents and published more than 300 papers on cybersecurity, creating impact through his pathfinding research to solve real world problems. In January 2016, Professor Deng was recognised for his long history of professional contributions to the field of cybersecurity when he was conferred the prestigious IEEE Fellowship.